Moments after boarding the bus to Milwaukee to begin her career in the Navy, Pinkie Wood received a phone call offering her an EMT job in her sleepy Northern Wisconsin town. Had she received the call a few hours earlier, she might have stayed, and taken an entirely different career path. As it went, though, Wood served in the Navy for seven years as an oceanographic systems tech analyst, working on computers in “buildings with no windows,” she explains, and leaves her covert job description at that. When she left the Navy as a petty officer second class in 1993, she transitioned to civilian roles, helping a trucking company get its IT systems operational, and working as an office manager for a drywall contractor. 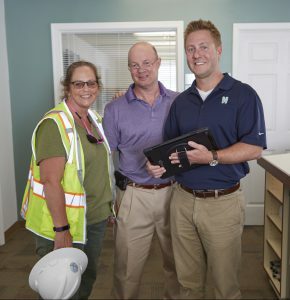 In 1997, she landed the opportunity that set her construction career in motion with Hampton Roads’ Peters & White Construction Co., which works on heavy utilities. Where she is today, as Hourigan’s Hampton Roads Safety Director, is a role that creates and implements safety policies and procedures and ensures that all project sites are compliant both with OSHA and our own stringent safety standards. It’s been almost 25 years since leaving the Navy, but she said the military taught her career and life skills: writing (“critical for communication”), the importance of paperwork (“I learned at a very early stage in my life that if it isn’t in writing it didn’t happen”) and dealing with various management types (“the military gives you exposure to all kinds of personalities”). But it is attention to detail, learned in the military, that has made her job as a safety officer so successful. It’s more than workforce skills that translate into construction, though. She encourages military members who are transitioning into civilian careers, particularly construction, to be patient. “Take some of the best of what you have learned and the worst of what you learned in the military, and carve your own career path,” she says. Pinkie is one of 11 veterans working at Hourigan, split between our two locations in Richmond and Hampton Roads. The vets’ roles range from project management to network engineering to IT director and even the company’s Chief Administrative Officer. Hourigan is certified as a Virginia Values Veterans (V3) company through the Virginia Department of Veterans Services, one of many to demonstrate a public commitment to hiring veterans.